The Numatic Carpet Cleaner 'George' 3 in 1 (GVE370) is designed to be a true all-in-one carpet cleaning machine, equally at home whether it's dry vacuuming, clean floors, wet pick-up vacuuming, dry floors, extraction carpet cleaning etc. The Prochem Bravo's compact size and manoeuvrability makes it ideal for spotting and quick cleaning of small carpet areas, upholstery and car interiors. The Numatic CTD-570-2 Carpet and Upholstery Cleaner has become a popular contractor's machine, providing not only exceptional power and performance but also the ability to take the knocks and bangs of commercial life. The Truvox Hydromist Compact Carpet Cleaner is a popular, easy to use, light and highly effective roller brush carpet cleaner that is used extensively in hospitals, nursing homes, hotels and schools. 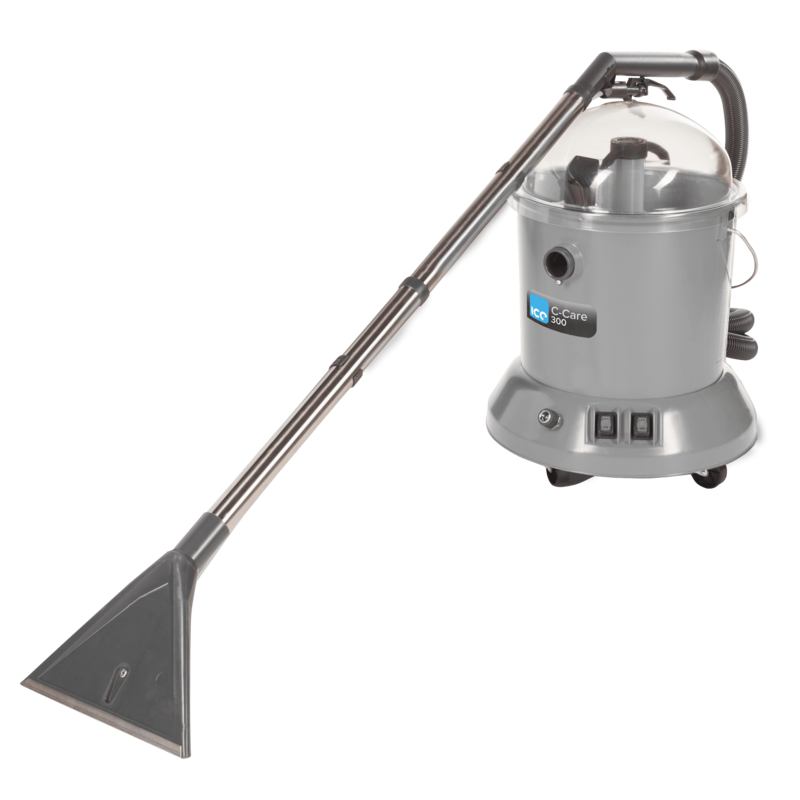 The Fivestar Carpet Cleaner is a highly compact and portable, high performance machine with floor cleaning option, the Prochem Fivestar upright extractor enables any operator to achieve professional results, and a quick drying time with the minimum of effort. This machine comes with a FREE training course worth £95.00. Full floating and self-levelling cylindrical powerbrush, eliminates the need for continual manual adjustment. Increased vacuum airflow reduces drying times and gives faster cleaning, up to 300² metres per hour. The Prochem Fibredri (TM4) is designed for use on all types of carpet. The machines uses a contra-rotating brush action to work the dry cleaning compound into the carpet pile. The Prochem Galaxy is great for people who want a professional carpet cleaning machine but need it at a competitive price. This machine is incredible value for money because of its reliability and the quality of cleaning it provides.With the Prochem Galaxy's compact design and lightweight yet hi-tech construction, the new Galaxy packs a powerful punch. With a powerful 2-stage vacuum the Galaxy delivers the same cleaning performance as much larger machines. The new Galaxy is perfect for in house cleaning as well as car valeting, spot cleaning and small area commercial cleaning. This is carpet cleaner is the biggest and most powerful of the SteemPro range giving you extra power and capacity to quickly and effectively clean in a variety of environments. The Prochem SX2700 is built to a very high standard, using high quality parts, featuring a tuff scuff-resistant body and solution tanks making this a very durable machine. This machine is one of the latest and most advanced carpet cleaners in Prochem’s market leading range of portable soil extractors. This carpet shampooing machine is ideal for both large and small areas. Bravo plus 10 l carpet cleaning machine complete with carpet wand and hoses. The Comet is Prochem's new low cost carpet extraction cleaner featuring powerful brush agitation to clean carpets faster and better. This is a carpet cleaning machine is designed to be compact yet demonstrates many characteristics of a larger machine. The new and upgraded Sabrina Maxi injection-extraction machine. Professional, injection-extraction machine specially designed to reduce the level of noise from the vacuum ONLY 60 DECIBELS. Professional, injection-extraction machine for fast cleaning of large areas of carpet and upholstery. Professional, injection-extraction machine with high pressure pump for greater cleaning ability. The Cleanfix System 7 (TW300S) is a deceptively robust and highly effective carpet and upholstery cleaner, it is largely used in nursing homes, hospitals and hotels, but can equally lend itself to many other applications. The Cleanfix System 7 is so light that it ensures ease of use for all operators. This highly popular carpet and upholstery cleaner is also used in the hire market because of its durability and the instructions on its side. The Cleanfix System 7s light and robust nature means that we often sell the System 7 to nursing homes to deal with residents who suffer from incontinence and spillages. However we have also sold these machines to domestic users who have a need for regular cleaning. The Cleanfix System 7 is therefore an all round solution to any carpet or upholstery cleaning needs, commercial or domestic. Comes complete with Carpet Adapter with 1 jet nozzle and plastic handtube, 26cm width; 3 metre suction hose; and 3.2 metre spray hose. Q. Can you supply spare parts for the Cleanfix System 7 Carpet Cleaner TW300S? A. Yes, we can order spare parts for this machine through our suppliers. Q. Do you sell the plastic lid to fit this cleaner and if so how much will it cost? A. Yes we can supply the replacement lids and other spare parts for this machine, please contact our sales office on 01562 512870 for prices. Q: What would be the best carpet shampoo to use with this machine? A: We would recommend Prochem extraction plus, which is supplied in a 5 litre container and can also be found on our website.